Just wanted to share a cheeky little recipe that I’ve been enjoying lately. I’ve started to get far more into the exercise side of things, which has coaxed me into looking at my diet. I have taken the advice of a few people who have researched a lot about nutrition from a fitness perspective, one of whom has Crohn’s themselves and is therefore more sensitive to the dietary requirements of people with an IBD. Alongside some solid advice from these people and my own bits of research I’m getting my head around some decent recipes and eating habits. I’ve started to use brown rice as opposed to white: I know that it takes longer to cook and tastes different, but doing my research I have seen that it has a whole list of health benefits when compared to refined white rice. This due to the fact that it has the hull and bran intact, which contain a lot of nutrients such as proteins, thiamine, calcium, magnesium, fiber, and potassium. As the brown rice take that much longer to cook I put this on to boil and leave to cook through, usually about 25 minutes. When it’s nearly cooked I put a frying pan on, add some olive oil, and put this on a medium to high heat. Next I prepare half an onion by peeling it and finely dicing it. I crack 4 medium sized eggs into a small bowl, add some pepper and using a fork whisk them together. By this time the rice is usually about done. I test it by getting a couple of grains out with a wooden spoon, putting them in my mouth and biting through them. If I’m able to bite through easily then they are ready. If not I give them a few more minutes. Once the rice has cooked I drain it, and cook the egg. This just goes into the hot frying pan, and is scrambled. As soon as its cooked it comes out and into a bowl, a little more oil’s added and in goes the onion. After a few seconds I add the sugar and mix this in to caramelise the onion. While the sugar is still liquid I add the rice, egg, and the soy sauce. This gets cooked together for a minute or two and is then served. 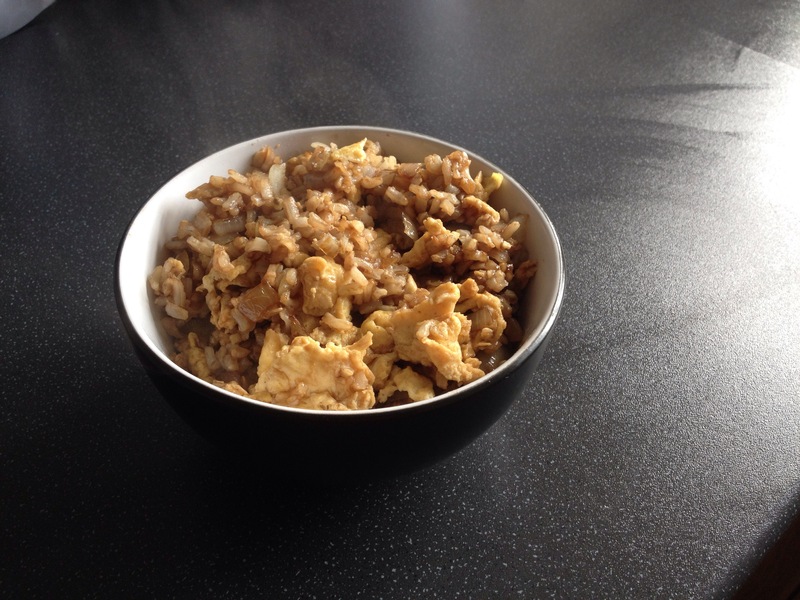 This entry was posted in Recipes and tagged Body building recipe, Brown rice recipe, Healthy living, Recipes, Vegetarian recipe. Bookmark the permalink. Tried this this evening…. It was really very nice… A delicate sweet taste and a lovely rich flavour of the soy sauce!! Will definitely have this again!